grandma's cookie jar: Special Birthday Month Giveaway on May 5, 2016 - Orkin Summer Scientist Bug Catching Kit! Special Birthday Month Giveaway on May 5, 2016 - Orkin Summer Scientist Bug Catching Kit! I was invited to share some mosquito beater fun with you and offer a fun giveaway, too, so this is an extra giveaway - just for the fun of it! Summer is almost here - this of course means picnics, baseball games, barbecues, water wars in the yard and all the fun of enjoying the great outdoors with your family. There is, however; one thing no one likes about being outdoors . . . mosquitoes! They are not only a nuisance, but they potentially pose health risks as well. Fortunately, as Orkin says, they study the science of mosquitoes and other pests in order to help keep them out of our homes this summer. To help you better prepare yourself and your family to fight the bite, Orkin presents the "Buzzer Beater" app, which features the "buzz" on mosquitoes. 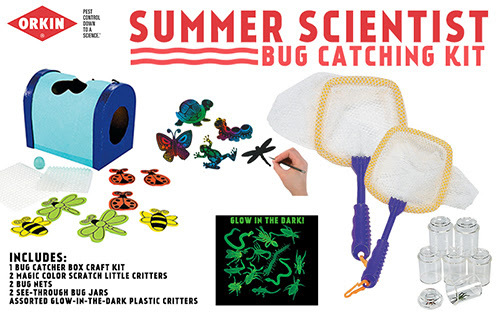 Test your own knowledge by taking the Buzzer Beater Quiz and enter a fun giveaway for one Orkin Summer Scientist Bug Catching Kit! This kit is fun for the whole family and includes . . .
One Bug Catcher Craft kit - let your own artistic personality shine while learning about nature and the world around us. Kit includes a variety of foam ladybugs, dragonflies and more! Two Bug Nets - children will have fun exploring and catching bugs with these fun mesh insect nets. Two see-through Bug Jars - if you are going to catch bugs, you have to have somewhere to put them . . . definitely not in grandma's house! Each clear plastic box has a magnifying lid for better insect viewing. Two Magic Color Scratch Little Garden Critters - another fun craft activity - simply scratch away the black coating to reveal rainbow colors and make your own unique butterflies, frogs, turtles and more! Glow-in-the-Dark Creepy Crawlers - turn off the lights and let them glow - these vinyl glow-in-the-dark bugs are a lot of fun! Sound fun? If you live in the USA, are over the age of 18 and would like to be included in the drawing - which will be on May 5, 2016 - for the Orkin Summer Scientist Bug Catching Kit, please comment below to tell me your "favorite" bug and if you have any rules which apply to bugs at your house . . . I do like butterflies and dragon flies . . . they are so pretty, and at my house the very important rule is, "Kill all spiders until they are dead and then kill them again." By my accounting, this means killing each spider a minimum of two times. I do NOT like spiders! And if you take the quiz below and comment to let me know the most interesting, surprising or helpful information you learned, you'll receive a bonus entry in this giveaway, too! In addition, if you have followed in Google Friend Connect, followed by liking on facebook with the tab in the "Find us on Facebook" box ON THE BLOG, or at this link (not just liking the post) and/or have followed grandma's cookie jar by email, you will receive one entry for each of these which you have done. Plus, if you "share" this post, you'll receive another entry (please let me know if you share). 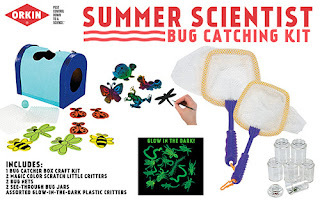 This will help me be able to draw names from among people who would like to win one Orkin Summer Scientist Bug Catching Kit and it gives you several ways to enter the giveaway! Please keep in mind, you will receive just one entry for each way you enter for each post - this means, for example, if you tweet each day about a particular giveaway, while I appreciate it, you will only receive one entry for the first tweet. Thank you for reading grandma's cookie jar and for sharing it with the people you know! We don't like spiders here. We all freak out when we see one. But the children are loving caterpillars. My son has four outside he's been "taking care of" for a day or so. Their names are John, Champ, Tom and Jerry. I'm surprised to see that yellow lights help not attract as many mosquitoes. I like butterflies too. I took the test and was surprised that bug spray isn't effective for long. I follow on Facebook and email. Mosquitoes can thrive on as little as an inch of water. I like butterflies and we have a rule for no bugs in the house. I learned that perfumes not colors draw mosquitoes to people.